Ruth Nieman, left, cooking with a Galileat host. It all started with a workshop in the Galilee. Ruth Nieman, a Jewish food writer and former caterer based in London who had visited Israel many times, returned to Northern Israel in 2016 to take part in a foraging adventure offered by culinary tour and excursion operator Galileat. That was how and when she became determined to share her appreciation of the spices, tastes and spirit of Galilean cuisine with an audience outside Israel. 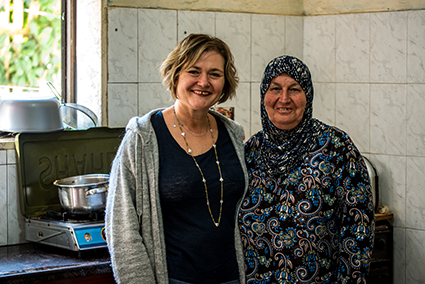 More than a year later, Nieman’s debut cookbook, The Galilean Kitchen, tells the stories of Galileat’s host chefs—women from Christian, Muslim, Druze and Bedouin Arab communities from across the lush northern Israeli region. A spotlight on the Arab kitchen beyond falafel and shawarma, The Galilean Kitchen focuses on fresh local products—high-quality suri olives (for which the area is known); local herbs such as white savory, with its gentle candied lemon and slightly minted aroma, and wild fennel, which is found in the grassy hills; and greens such as purslane and wild cyclamen. 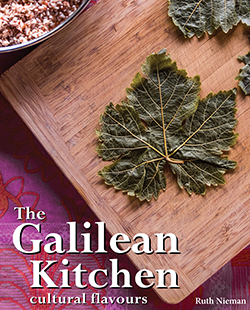 Cookbook chapters and recipes revolve around the rich cultural stories recounted by the hosts as well as the native ingredients that define Galilean cooking. From spices such as bitter-almond-like mahlab and licorice yansoon, found in the region’s sweets, to foraged seasonal mallow and dandelion greens; from heirloom vegetables including fakus (a cucumber-like melon, usually eaten raw) to grains like freekeh-green roasted durum wheat, the exotic appeal of this foodway is decoded for the novice reader. Spice blends like sweet and spicy Baharat and pungent za’atar accompany most dishes, and everyday super grains like wheat groats are highly utilized. This mostly plant-based diet, with sour highlights including tangy labaneh, zingy sumac, light lemony cardamom and a liberal use of fresh-squeezed lemon juice, is met by the aromatically warm and spicy, yet mellow undertones of nutmeg, cloves, peppercorn, and chili. It is a flavor combination that differentiates the Galilean kitchen from other Arab kitchens of the Middle East. “If you go to my kitchen at home, you will be met with recipe books, cards and notes at every turn,” Nieman said. “These women who cook in humble kitchens, often without gadgets, cook every dish from scratch and by heart. All the recipes have been handed down through the generations, with their own additional personal touches of flavor. “Galilean cuisine is about the cooking, the sharing, the hospitality and the spices,” Nieman added. The book includes a foraging guide to the region’s wild greens, herbs and vegetables. 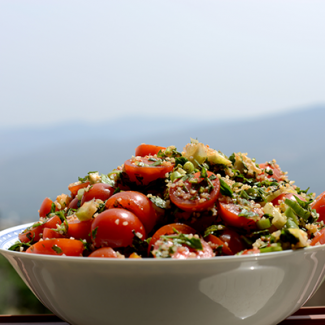 Recipes include local variations of the classic dishes of majadra (typically rice cooked with lentils and caramelized onions but reproduced in the cookbook in its traditional Northern Israeli form using bulgur wheat); and manakish (pita with an olive oil and za’atar spice paste that has been cooked in a fiery tabun oven). I am sharing with you here a Galilean interpretation of tabbouleh, spiced lentil soup and butter cookies with sweet date filling. B’teyavon! Halve the cherry tomatoes and place in a bowl. Add the spring onions, diced lemon, parsley and mint, and mix well. Soak the bulgur in lightly salted boiling water for 10-15 minutes, covered with plastic wrap, until grains are soft and swollen. Make the dressing: Mix together the olive oil, lemon juice, salt and pepper together in a small bowl. Add the bulgur, paprika and dressing to the salad, and mix well. Leave for 30 minutes before serving to allow the flavours to mingle. Place the onion, red pepper, carrot and chili into a saucepan, add the olive oil, and cook on a medium heat for 5 –10 minutes until the vegetables are beginning to soften, stir occasionally to prevent sticking and browning. Add the lentils to the vegetables and stir well to coat with olive oil. 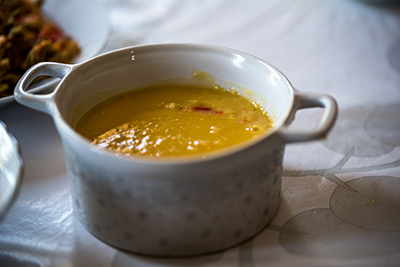 Add the salt and chicken soup mix to the lentils, then cover with cold water and stir before placing a tight-fitting lid on the saucepan. Cook on medium heat for about 1 hour, or until the lentils and vegetables are really soft, stirring occasionally while cooking. Turn off the heat and leave the lid on the saucepan to allow the lentils and vegetables to steam for about 15-20 minutes, which will develop the flavors. Combine the flour, salt, butter, sugar and spices in a bowl and mix. Add the milk or yogurt and stir well to bind the pastry ingredients together. Let the dough rest for 1 to 2 hours. 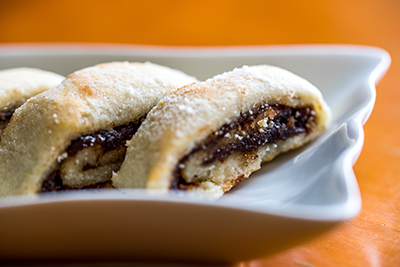 Make the filling by pounding the dates with milk or margarine to get a soft, spreadable paste. Remove from the fridge and cut each strip into slices 1/2-inch thick, then arrange the slices on a baking tray. Bake in a preheated oven on 350 for 15-20 minutes until brown. Wow, such a variety and so many options… Love the Galilee and their special cuisines.